How can Tree of Hope help with Plagiocephaly treatment for my child? Plagiocephaly is asymmetry (unevenness) in the shape of a baby’s skull. It is often known as ‘flat head syndrome’. Tree of Hope supports children with Plagiocephaly to fundraise for treatment. The charity has helped a number of families access our fundraising service to pay for plagiocephaly band treatment from establishments including Ahead for Babies, The London Orthotics Clinic and Technology in Motion. The treatment involves the child wearing a custom-made orthosis helmet for a period of between 4 and 6 months, and during this time the band is closely monitored and adjusted if need be eventually correcting the shape of the baby’s head. The NHS does not actively advocate the use of corrective helmets. Their view is that, following the guidelines for the ‘back to sleep’ campaign, where babies should be positioned on their backs to reduce the likelihood of sudden infant death syndrome or cot death, babies who subsequently develop a ‘flat head’ should be encouraged to play on their tummies, in order to redress the compression caused by lying on their backs. Whilst this is effective in the majority of cases of plagiocephaly, 13% will experience minor improvement in the head shape and 4% of this group will remain severe. For the small group of severe cases, plagiocephaly treatment offers the opportunity for the head shape to be brought in line with that of their peers. Whilst it is a cosmetic intervention, it could be considered to have wider benefits from a psychosocial perspective. The cost of a plagiocephaly headband or helmet can be around £2000 and Tree of Hope supports families in fundraising for this treatment. 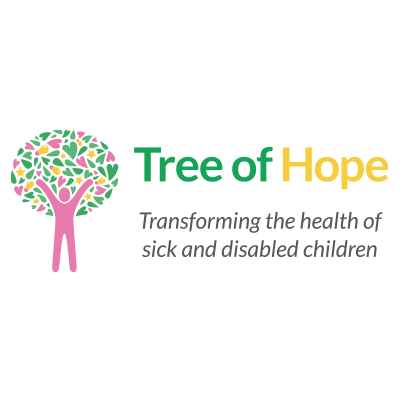 To discuss starting your fundraising campaign with Tree of Hope please contact Georgie in our Family Support Team on 01892 535525 or via families@treeofhope.org.uk.